Our basement is done…well, not everything in it. First off, we don’t have a couch (we plan to make part of it a theatre area). And I have this great table and chairs set (given by friends) but they are the same color as the floor. So I talked to my mother in-law about painting this bad boy. 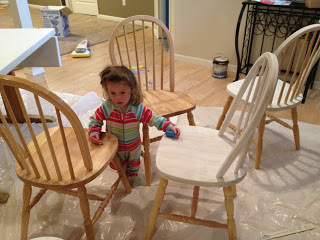 She loved the idea and we have set out to transform this set! In the end it will be black and the chairs will be a cream color. I wanted to take before pictures…I forgot so here’s what you get. The white is primer. 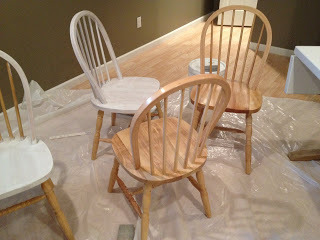 I finished sanding all the chairs today and have to prime them. 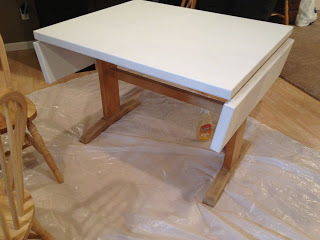 My MIL is coming Friday and my plan is to have it ready to coat with the final paint colors (black and cream). Stay tuned to see progress and the final product!! !